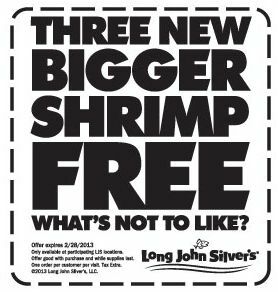 Click the link below to go to the coupon print page. 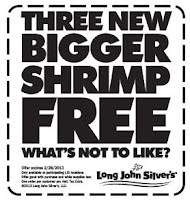 Print the coupon redeem it today 2/28/13 @ Long John Silver's for Free Bigger Shrimp. Sorry I have been crazy busy thought I posted this :/ oopsy I saved it as a draft darn it! Have a great day everyone.